If you spend your day changing diapers, eating chocolate every chance you get, or doing your best to squeeze into those pink exercise shorts that rise way above your belly button only minutes before a string of crimes ravage your neighborhood, you might be Lotty Brooks, the main character in The Glamorous Life of a Mediocre Housewife. Crissy Sharp, author of The Enemy Nextdoor and Other Misunderstandings and Love and Fat-free Cheese, has written another humor-filled mystery. 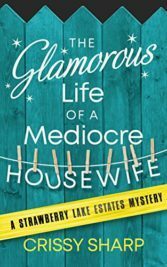 The Glamorous Life of a Mediocre Housewife had me laughing from page one and my husband questioning my hysterical giggles through to the end. Somehow, Sharp managed to add a mystery in the middle of it all, making this book one you can’t put down. We’ve been there, all of us. We spend our days wondering if we’ll get the chance to shower. And forget the cute clothes—comfy yoga pants and t-shirts are all we need for a life with toddlers anyway. The effort’s still worth it, but exhaustion took over our lives a long time ago, and of course, across the street, lives the perfect woman, thin, stylish, and a mother. We hate her. Add to that a failing marriage, and that is Lotty Brooks. To us, she’s awesome, unlike her neighbor (and ours). Scene after scene, Lotty tells it like it is. All of our hurts and failures, all of our wants and desires, outed by one fictional character so flawlessly written, we know she should be our best friend. I haven’t had children in diapers or hanging on my leg as I walked down the street in years, but I love Lotty. Her husband, Jason, is a pretty cool guy too, which makes it hard to understand what happened to their marriage all those months ago. 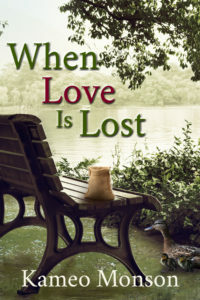 As the title suggests, this book is lighthearted and fun with a mystery you can solve right along side of the characters. I enjoyed solving it while giggling at the predicaments Lotty finds herself in. There are a couple of tense places, but Sharp balances tension and humor beautifully. This read will keep you smiling. Grab the chocolate and a blanket and cozy-up, then thank me later. While both The Enemy Nextdoor and Other Misunderstandings and The Glamorous Life of a Mediocre Housewife are both Strawberry Lake Estate Mysteries, the books stand completely on their own. I received a free copy of this book for review. All opinions are my own.